We are glad to announce that we have rewarded our top 10 traders. The total amount of our May giveaway was $350. Want to be in with a chance of sharing in Q3’s fees? Sign up today! 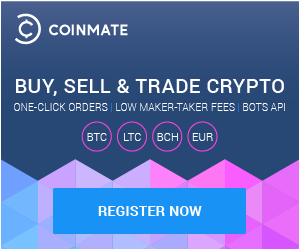 Coinmate.io is the first and only Bitcoin trading portal that rewards clients with a share of collected trading fees. The higher the trading volumes, the higher the share is. Our top trader receives 20% share of collected trading fees, 2nd 14%, 3rd 10%, and 4th – 10th 8% each. Please note, reward will be paid quarterly from now we reserve the right to share only partial of trading fees. Top ten Bitcoin traders can expect their next reward in August 2015 for the period from June-September. We reserve the right to alter the terms or cancel this promotion at any time. We will announce further information during Q3 2015. We are glad to announce that we have rewarded our top 10 traders. The total amount of our April giveaway was $614.59. Want to be in with a chance of sharing in May’s fees? Sign up today! Next round ends on 31st May and if the portal trading volumes increase we will share even higher bonuses. Qualify within the top 10 traders and you will be rewarded. Sign up today!